Join our workshops targeting the fast growing Kenyan Outbound Market to the Rest of Africa. 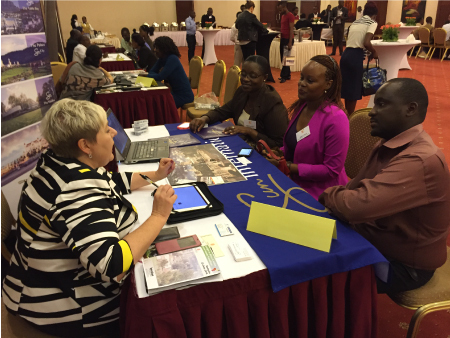 Our Spotlight workshops in Nairobi over the past 15 years have been extremely well attended by the Kenyan Travel Trade – 258 attended in 2018 with 29 Exhibitors participating. Inter-regional destinations within East Africa and to The Rest of Africa /Indian Ocean. The Gulf Region, Asia and Europe. Domestic, Business Travel, Conferences within Kenya. The outbound market from Kenya to overseas destinations and the rest of Africa continues to show a good growth pattern. Kenya is a prime market for South Africa with 29,000 Arrivals in 2017 plus thousands of expats resident in Kenya who visit South Africa on business and holidays. The estimated total arrivals from Kenya to South Africa is close to 60,000 pax per annum. Nairobi has a population of over 4 million and Kenya has one of Africa’s fastest growing middle class populations. After Nigeria, Angola & South Africa Kenya has Africa’s fourth highest number of wealthy individuals. 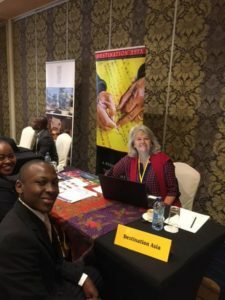 The expatriate and Diplomatic communities and the United Nations Agencies headquartered in Nairobi represent a major business and leisure travel market opportunity with the added potential of significant conference business. Other important Kenyan outbound market segments include shopping, medical tourism, sports groups and buyers attending trade exhibitions. We have such a great response in Nairobi that for the past few years we have had to have TWO separate sessions in different parts of the City with over 100 attendees at each session! – see programme below. Our VIP networking Cocktail party that we have organised in the past three years has been very well attended by Directors and Senior Managers of the major Travel Agency and Tour Operators in Nairobi. 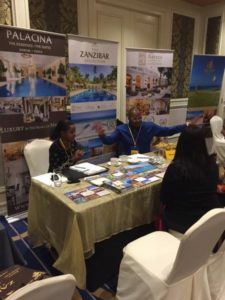 This function, organised the night before the actual workshops in Nairobi, gives exhibitors to opportunity to meet Senior Executives of the major Travel Agencies and other Travel Trade players in a relaxed social environment. In 2018 Houston Travel Marketing services hosted 10 Travel Agency Managers from Mombasa. For 2019 It is our intention to once again host buyers from Mombasa and also Travel agency managers from Uganda, Dar es Salaam and Rwanda. Tour Operators selling Indian Ocean Islands, the Gulf and Asia. Government Departments, NGO’s and UN Agencies (Nairobi is the Africa HQ for UNO). EXPECTED ATTENDANCE: 258 trade attended in 2018. Due to the high number of attendees at our Nairobi workshops we do two morning sessions in Nairobi in two different areas of the city. We expect 100 to attend each Nairobi morning session. The Spotlight workshops will be extensively advertised to the Travel Trade in Kenya by e-mail broadcasts. We will also encourage Travel Agents to invite their Corporate Accounts to attend the workshops with them. Our Hotel and Airline partners will distribute invitations to their Key Corporate Accounts and Conference Organisers. We have appointed a well known Nairobi-based Events Company to distribute the invitations, handle the registrations and to chase up the replies. Both the Kenya Association of Travel Agents (KATA) and KATO (Kenya Association of Tour Operators) support Spotlight and send out invites to their members. The workshop format will be a FREE FLOW table-top format with approximately 30 tables. Two x 3-hour morning workshop sessions in Nairobi. Day free for sales calls in Nairobi. 18h30 – 20h30: VIP Networking party at Park Inn by Radisson Westlands. 07h30: Set-up tables at Movenpick Hotel Conference Centre. 08h30 – 12h30: Light breakfast and Workshop for approx 100 trade. 12h30: Lunch for attendees and Senior Managers. 13h00: Prizes and end of workshop. 07h30: Set-up tables at Radisson Blu Conference Centre. USD1,600 (ZAR21,500 plus VAT for South African companies) for Nairobi for one networking cocktail party & two sessions. Full contact address list of all attendees will be sent to exhibitors after the workshops. South Africans do not require visas for Kenya. Most other Nationalities require visas for Kenya. Please ensure you apply at least six weeks before date of Travel as application procedures are very involved, lengthy and expensive. Yellow fever inoculation certificates are required. Letters of support can be provided. Movenpick Hotel is offering a rate of USD190.00 inclusive of breakfast, taxes and internet. All hotels offer Airport pick-up transfers which can be charged to your room. UBER also operates in Nairobi for airport and hotel to workshop transfers. Payment can be made either in EUR, USD or ZAR to Houston Travel Marketing Services in South Africa. Rand / Dollar / EURO Exchange Rates: Houston Travel Marketing Services reserves the right to increase the Rand and US Dollar cost of the workshops due to fluctuations in the exchange rates. All bookings are subject to the Standard Terms & Conditions of Houston Travel Marketing Services CC as published here: Terms and Conditions of Participation. Share with your Travel colleagues! Spotlight Eastern Europe a Resounding Success! Houston Travel Marketing Services updated their cover photo. Houston Travel Marketing Services shared a post. 200 copies of the magazine were snapped up by the 150 Lusaka Travel agents attending Spotlight. Lusaka Trade are showing great interest in Tanzania as a destination for their leisure clients. Many of the corporate Agents mentioned that DAR was popular with business Travellers. Zambia being a landlocked country Indian Ocean beach destinations, especially Zanzibar, were Big sellers.